Welcome to the event blog of the Salford Together Big Event held on Wednesday 24 January at the AJ Bell Stadium, Salford. From July through to September 2017, our team were out in the community finding out your views on how we can transform the delivery of Salford health and care services as part of the Big Conversation. Over three busy months, our staff and partners reached out and spoke directly to the Salford community to hear your views, at a range of venues; neighbourhood community meetings, local shopping centres and summer events. Special thanks go to Key 103, our media partner and supporters of the campaign, spreading the word via the Key 103 bus out at various festivals and events. And tonight they have invited competition winners, who were entered into a prize draw when they pledged to join the Big Conversation. 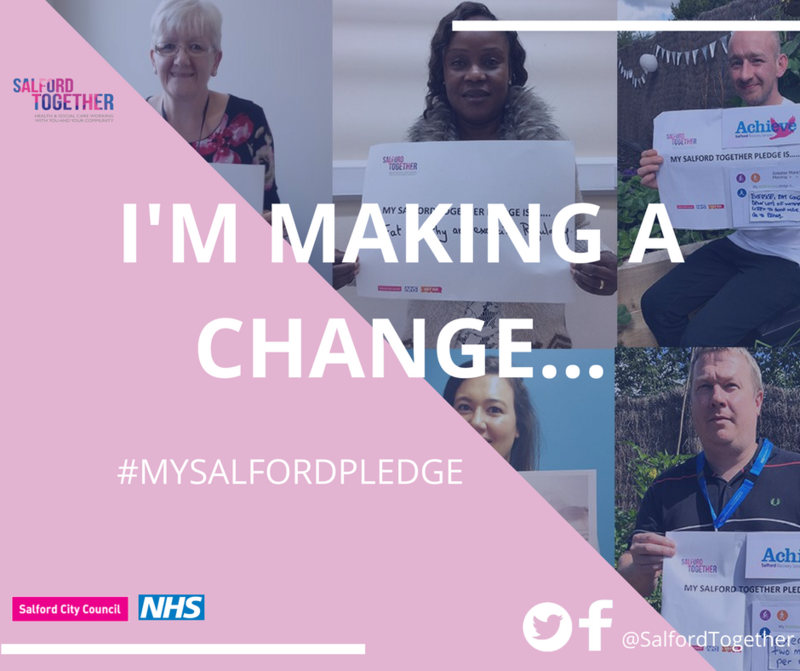 Follow #mysalfordpledge to hear feedback from the big health and care conversation @SalfordTogether excited! It’s felt like a journey to this point and tonight we are delighted to welcome Salford partners, professionals and residents to celebrate the achievements of the Big Conversation. Following registration, guests enjoy a warm welcome from local singer Christian Smith before we begin the celebrations. 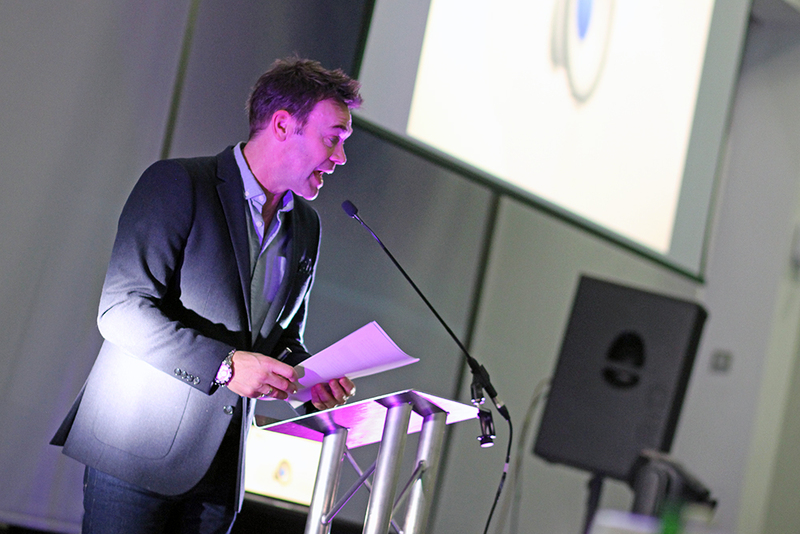 Darren Proctor, Key 103 & Key 2 DJ and our host for the evening, kicks off the evening with introductions and an overview of the evening ahead. Tonight we’re here to celebrate everyone who took part in the Big Conversation and to find out what’s next, so all that hard work doesn’t stop here. 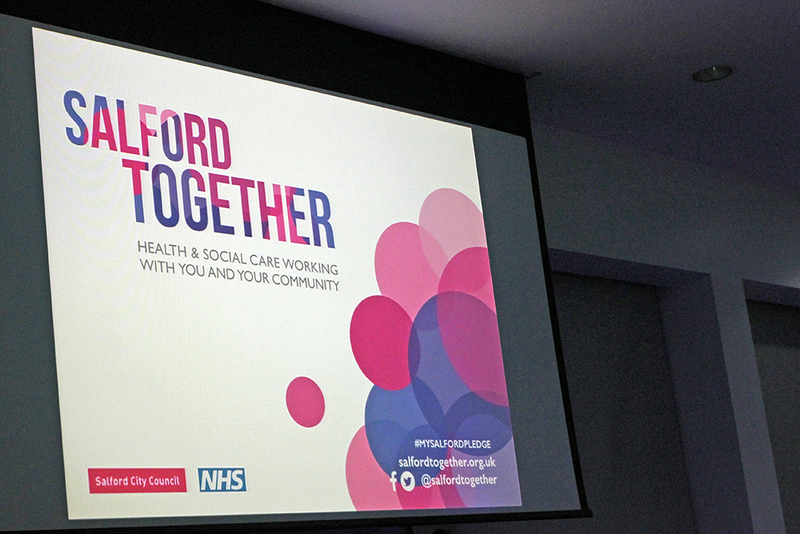 We asked the public, NHS front line staff and senior representatives from Salford Together partners to contribute to Salford Together future plans and they are all represented in the room tonight. Confused about Salford Together? Find out what we’re all about in this short film. Over the summer Salford Together held a comprehensive engagement exercise with the people of Salford. The aim was to provide early opportunities for active, open, dialogue on developing health and social care plans in Salford and to allow service users, carers and other stakeholders to input to and be involved in the transformation process. This short animation perfectly rounds up the results and trends of the Big Conversation, with highlights including attendance at 189 community events and forums, spoken to 4,200 salford people and 1,670 completed questionnaires received. Read the full Big Conversation final report here. 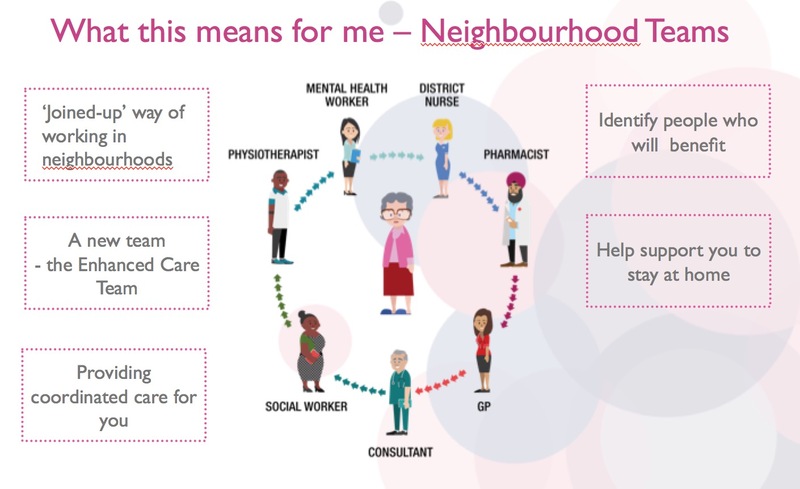 Neighbourhood services is where we really want to make a difference, so it’s over to June Roberts to explain what this work means for you. 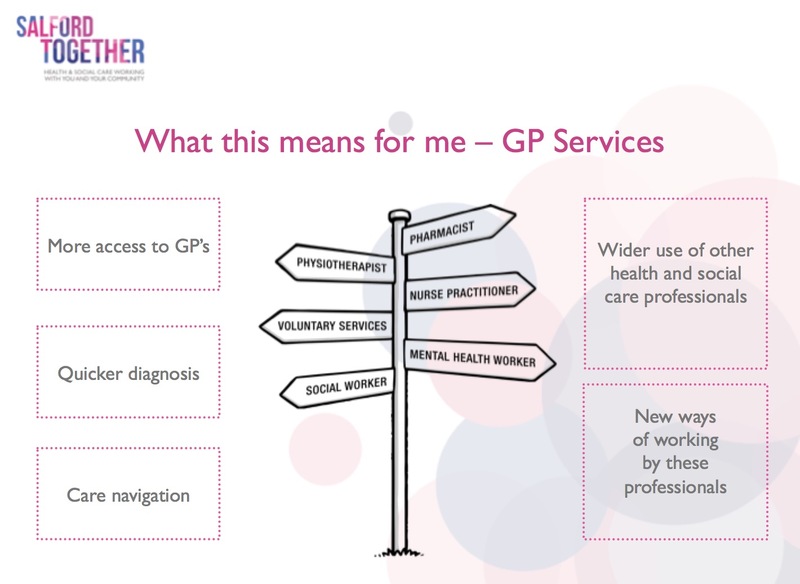 June, Head of Service Innovation and Transformation at Salford Together explains this work is clustered around GP practices and will be a joined up way of working within neighbourhoods. June reveals a new team, the Enhanced Care Team, who will be providing coordinated care for residents, working closely with voluntary groups, to help you to receive care at home when appropriate. A second team, the Salford Urgent Care Team will start in April, supporting you in times of crisis providing care in your home, wherever you live in Salford to ensure you’re supported safely at home. By bringing care closer to home, and a special set of expertise out of hospitals we hope to release pressure on individuals and hospital services. This leads us into a Q&A session with an expert panel, our speakers are joined on stage by Alison Page, CEO at Salford Community and Voluntary Services and Karen Hodgetts, Head of Operations (Salford) at Greater Manchester Mental Health. The panel are asked about the benefits of the new approaches and gaining trust from residents. The panel are united in their approach to earn trust by continually asking people, checking in that we’re doing the right thing and meeting their needs. A full report that details the findings of the Big Conversation and answers to these questions can be found here. Proud resident and Chief Executive Officer at NHS Salford CCG, Anthony Hassall is next up to talk about how we can work together to make a difference. In addition to the report findings, Salford Together developed a citizen pledge concept where people were encouraged to consider one step they could take to make a big difference to their own/their dependents health and social care outcomes. Anthony reflects on the hundreds of people in Salford who have pledged to help transform health and social care in the city. Leaders, front line staff and citizens all signed up to make a change and take responsibility for their own wellbeing. The challenge is now to get more people to pledge and to encourage other to change habits, small changes that could have a big impact. Simple actions like swapping the lift for the stairs, chocolate for fruit, fizzy drinks for water. Or make sure you cancel appointments you know you can’t make and access services responsibly. It’s important we lead by example, so here’s our video to you! System leaders feature describing what they’re going to play their part, holding the rest of the system to account, to deliver our part of the bargain. Darren is back to the front, bringing people’s attention to the pledge cards on the tables. We asked our guests to share their pledge, tell us what you have done or what you plan to do to put your pledge into action. Remind yourself of the hundred of pledges that were made right here in Salford, to transform health and social care in our city. From regular exercise, becoming more involved in your community to using services at the right time and wisely, these small changes can make a big impact. All our pledgers were then treated to a performance by special guests, Britain’s Got Talent finalists, DNA. Andrew and Darren are the mind reading double act that make up DNA. Feeling gobsmacked and spooked, the whole room were left wondering how they did it… especially the t-shirt stunt! So, it’s over to you. Remind yourself or your pledge, or make a new pledge and share your updates with us.